My fifth layout is all about our favorite or special Christmas ornaments. 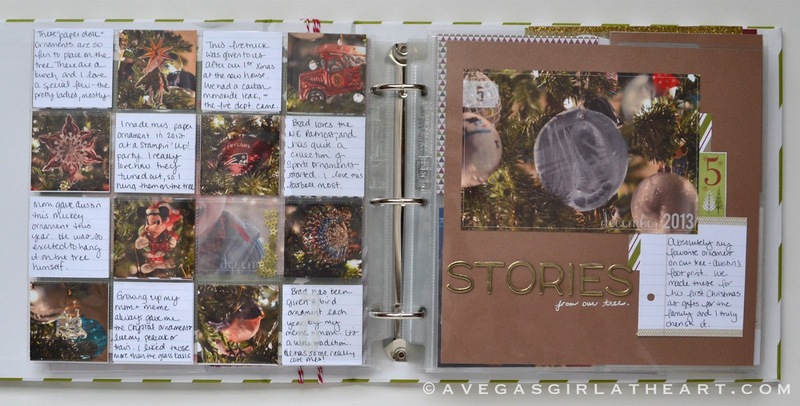 I used a 16 pocket page protector on the left, and alternated photos with journaling. One spot also has the see through gold star sequin pocket I showed the other day. Opposite, I have my favorite ornament, a salt dough ornament of Austin's footprint that we made back in 2011 (you can view my post about them here). 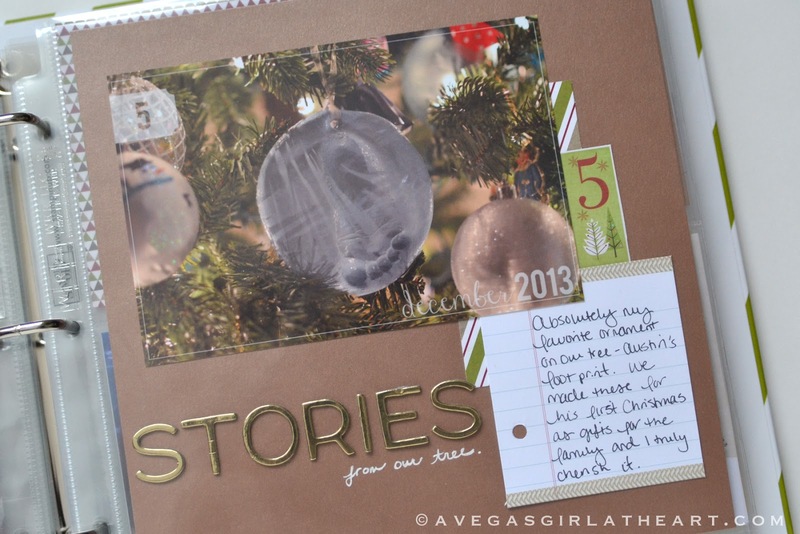 I even added a little journaling spot to this page, with some washi tape along the top and bottom edges. 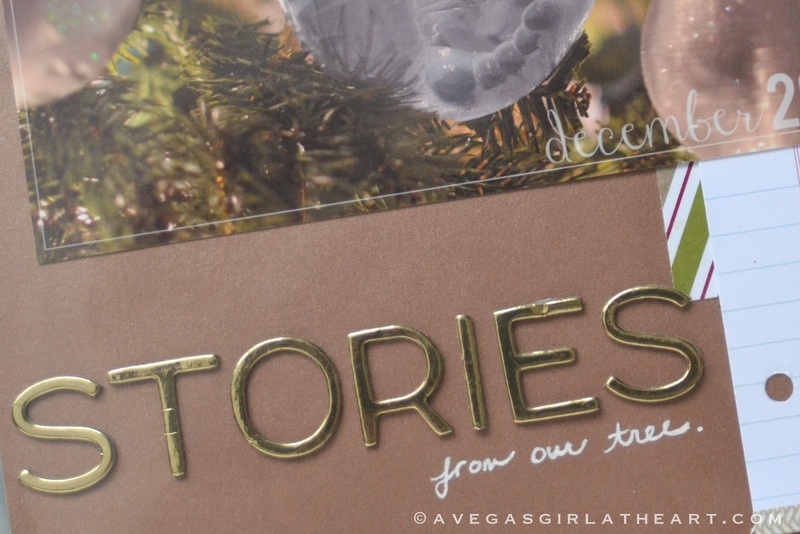 For the title, I used gold American Crafts thickers and added my own handwriting in a white Gelly Roll pen. On December 6th we attended my work holiday party, so I used photos from that event. I ran a strip of silver and white striped ribbon, along with red glitter ribbon, across the page. Then I cut up a photo booth strip and scattered the photos, lifting them with some foam pop dots for some dimension. On the right side, I had 4 4x4 pockets. I included a piece of patterned paper, some shimmer card stock, and a journaling card, along with a selfie I snapped of us at the party. I included our room key along with some glitter alphas (Recollections brand) saying "night away." 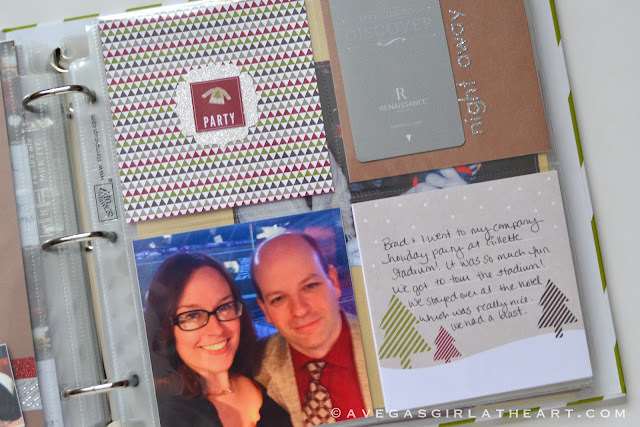 In that top left pocket I just punched out some glitter card stock with a punch from Stampin' Up! 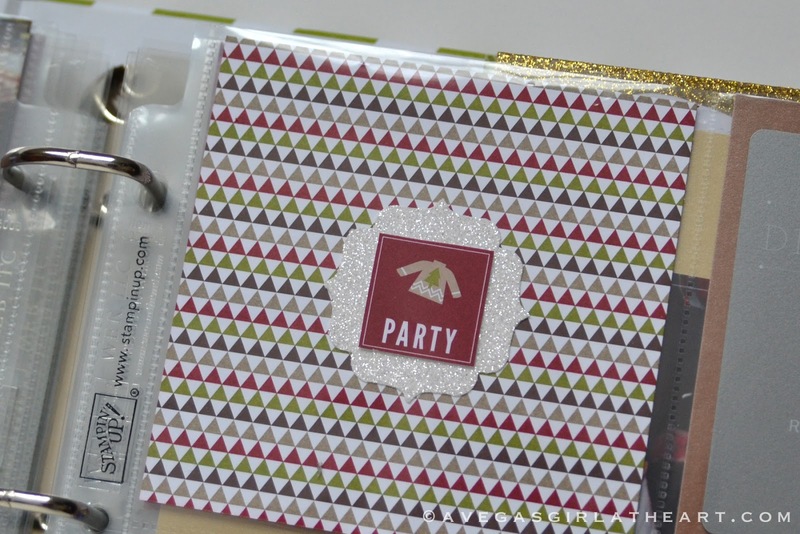 (Bracket Label from the holiday catalog), and cut out the "party" spot from a filler card from the kit I am using. 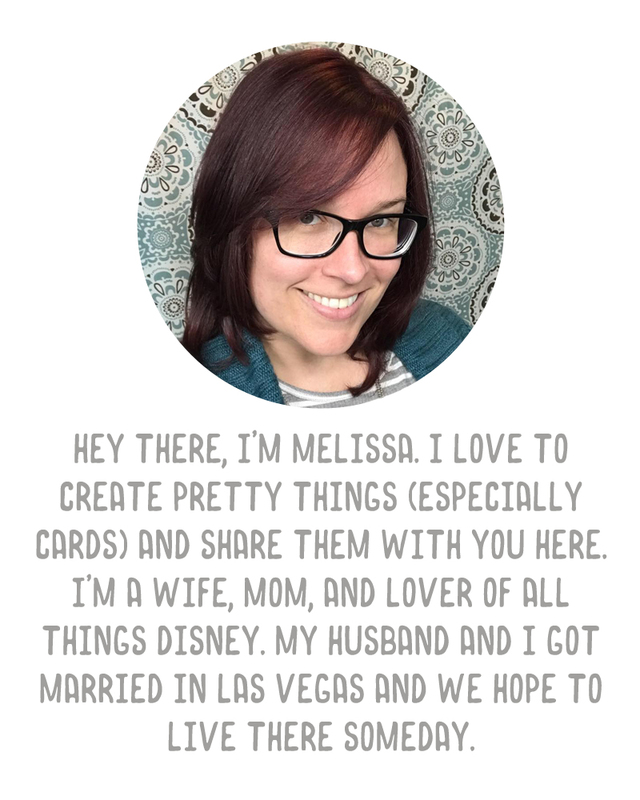 (You can see what the card looked like on my foundation page, here). Keeping up with DD is Ali's full-time job! ;) Your album is amazing. Thanks for sharing!!! December 5th is my favorite DD layout that I've ever seen! Love that you documented your fav. 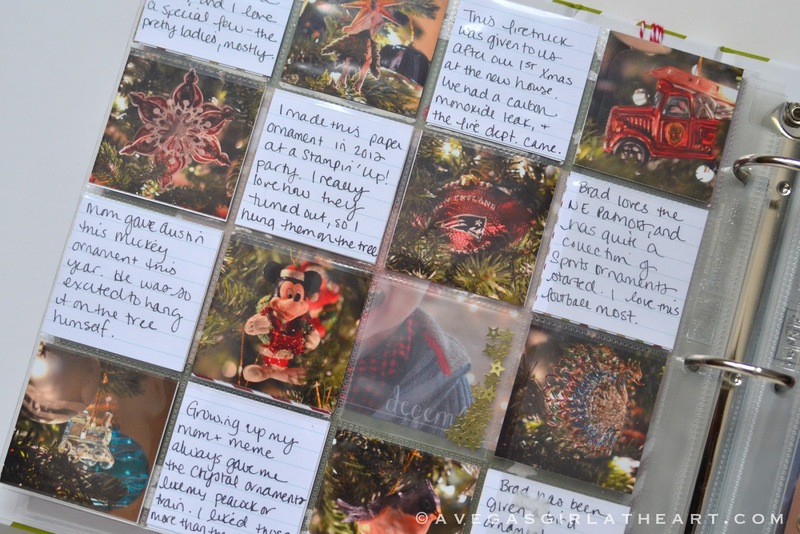 ornaments, what a great idea! Oh hun, I've been doing my "Daily December" for a couple of years now, lol! I think I bought a SU album for 2011 and never touched it, then got 2 pages done in 2012 and a few more in 2013....obviously this is going to take me a decade at this rate, ;) But there is hope, yesterday invested in my first Project Life materials and have done a full page in half hour, breathing new life into an 'ooooo-ld' scrapbook album! 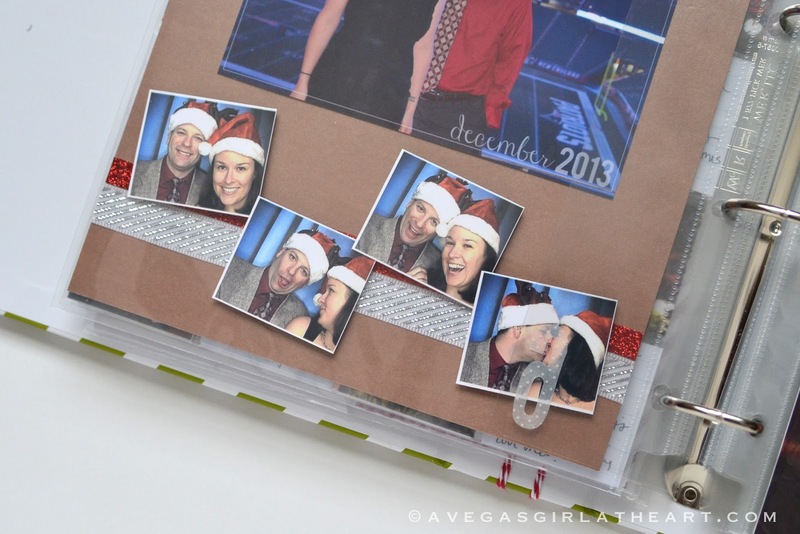 Love your layouts and colours and all the thoughtful touches!